I watched a film on SBS Sunday night that was quite disturbing, and a revelation at the same time. Now I would consider myself a fairly intelligent bloke (some would disagree), and I don’t often get caught up in fads, the latest diet and conspiracy theories, however this film had me paying a little more attention to that fiendish white granular carbohydrate. Now I like my sweet foods, and nothing is going to stop me from eating them, however I do know that like pretty much everything in life, except cycling of course, moderation is the key. But, the amount of hidden sugars in the everyday foods we eat, and the cost to our health by over indulging is a level of absurdity I hadn’t paid too much attention to. If you didn’t catch it, try finding it on SBS On Demand. it will be well worth your while. That Sugar Film is a 2014 Australian documentary starring and directed by Damon Gameau. The film follows Gameau’s experiment on himself, changing from a low sugar diet to a high sugar diet for 60 days. His strategy was to only eat foods that were marketed as a healthy option such as low fat foods, juices and the like, what we would find in the processed foods section in your standard supermarket. His target was to eat the equivalent to forty teaspoons of sugar per day, a standard amount in an Australians diet. We watched him as he as he gained weight, grew lethargic, and developed fatty liver disease, all at the same time as he was maintaining as much as possible his standard healthy life. By the end of the experiment he had put on 8.5 kilograms, developed pre type 2 diabetes and heart disease risks, had an extra 10 centimetres of the dangerous visceral fat around his stomach and noticed an impact on his moods and cognitive functions. So it’s the weight and fat bit that got me thinking about adding it to this weeks posting. Weight is one of the biggest issues with cyclists. It’s there in our face every time we jump into the interweb looking to buy new components. So I see the “rationing” of sugar in my diet as being one of my biggest opportunities, aside from just riding that is, to improve, by keeping the weight down. Oh, as a by the way, The World Health Organisation wants us to limit our sugar intake to six teaspoons (25 grams) a day. Youch. Processed food, be very very wary of it. You may have noticed a change or two with this blog. First up, this is the soft unveiling of the new Wednesday Legs. Thanks to Nat over at Spin Cycle Clothing for developing the logo for me. And thanks for Mary, my favourite Interior Designer, for helping me out with the cpolour schemes. The pale blue sky, the lush green grass, and red for the setting sun. The chevron represents the Adelaide Hills, a place that I hold close to my heart. We’ll see where this all goes, but I’m keen to get a Wednesday Legs kit designed around this logo and colour scheme. And secondly, the blog look. Im playing around with a few options, so you may see a few changes over the coming months. The header image will change, I;m nit entirely happy with it, but I need to mull it over for a while. 34-year-old Philippe Gilbert (Quick-Step) attacked with more than 50km from the finish line and held off a chasing field to claim his biggest win since the 2012 world championships. On Sunday, everything went right for Phil, who was raised in a village at the base of the La Redoute, the famous climb of Liège-Bastogne-Liège, won the biggest race in Flanders. His legs held out, he didn’t bonk, and didn’t cramp up. No one could bridge out, and he didn’t crash, didn’t puncture, and didn’t panic. Looking back with 1km to go, he had more than enough time to celebrate. At the finish line, the former world champion had enough time to get off his bike, and carry it across the line, held triumphantly in the air. “I was close to the barriers. I was in control when I was close to the barriers, but I think we caught a jacket or something, because if I’d hit the barrier, I would have been on the ground straight away, and the bike would have stayed there,” Sagan said after the race. Rivera outkicked two-time Australian road race champion Gracie Elvin (Orica-Scott) and last year’s Gent-Wevelgem winner Chantal Blaak (Boels-Dolmans) in a select bunch sprint in the 153.3km cobbled classic – the longest race of the WWT this season . Congratulations Rivera for her win and being the first American to win the Womens Flanders. Congratulation to Gracie Elvin from Orica Scott Women for being the first Australian woman to podium at the Womens Flanders. Orbea have released a new adventure bike, using the Spanish brand’s range of road & endurance bikes for design inspiration, to come up with TERRA, a longer wheelbased bike with a more relaxed geometry, alongside a revised fork and carbon lay-up process, to lend more comfort and compliance in key areas where it’s needed. Terra is for riders who do enough riding off-tarmac to need something tougher than a traditional road or endurance bike. It looks like a fun bike that can fill several roles – Gravel, Road, CX, Winter Training or Commuting. Prices for a complete TERRA start at $2,999US, all the way up the range topping Shimano Ultegra/FSA equipped M20iD. I’ve not met Anthony, have been meaning to get around to his workshop in Hyde Park, but time has run away from me. I have however heard many good things about Anthony’s services over the years, so I decided to touch base with Anthony about a feature. Fortunately he accepted. I was born into a non-traditional Italian family and grew up in the Western Suburbs of Adelaide. At the age of 23 I traveled overseas and eventually settled in Sydney. It was here that I went to university to study a MBA and Masters of Finance, meet a girl and got married. I worked in number of marketing roles in the healthcare industry, however my passion was always in cycling and the biomechanics behind it. My wife and I decided to move back to Adelaide about 5 years ago and that’s when I started Elbows Akimbo. I am currently studying human movement at UNISA and enjoying the challenges associated with juggling life with 2 kids, cycling and running my business. You run a business called Elbows Akimbo, what is it and where did the name come from? Elbows Akimbo is a business focused on providing high quality, state-of-art bike servicing and fitting for cyclists of all levels. In terms of the origin of the name of the business, I read an article where a journalist had used the term to describe the riding style of Johan Museeuw during the Paris-Roubaix. At the time I was developing a business plan for a bike store, and it just resonated with me. With your experience seeing all sorts of cyclists pass through your doors, what are some of the more common problems you see? For bike fitting, it is usually some type of discomfort with the contact points (saddle, handlebars and shoes/pedals) as well as lower back and knee pain. For bike servicing, creaking. People almost always think it’s the bottom bracket. All noises seems to emanate from the BB. Sometimes it is, but often it’s something else like the headset, front or rear hub, saddle etc. How long have you been cycling and what got you started? I started riding a roadie when I was in high school, probably when I was 14 or 15. I don’t know what go me started, I had a couple of friends and we were interested in cycling and it just started from there. We didn’t really have any mentors or people to encourage us, we just picked it up. How many bikes do you own and what is your main go to bike? I’ve only have three bikes. My main bike is a Pinarello Prince circa 2007. I also have an aluminium Trek that has been resprayed and I use that as a spare and for the trainer. The third bike is 24” BMX Sunday cruiser that I bought so that I could go riding with my daughters. What bike do you covet? The Pinerallo, they really are great bikes. I think that they offer a complete package – quality, finish, performance, handling and ride quality – it’s really hard to get that combination with any other brand. What tools would you recommend a cyclist have at home bike shed? A pair of pointy nose pliers. What are your pet love and hates about cycling? The great thing about cycling is that just about anyone can participate and if the will is there, they can get pretty good. I think this is part of the reason why cycling has become so popular. However, one of the issues with such large participation rates and novices is that cycling etiquette and safety out on the road at times could be better. Other than yourself, who is your favourite cyclist? At the moment I’m a big fan of Richie Porte. It’s great to see an Aussie who has the talent to win a grand tour riding at the top of his game. If you could have dinner with 3 people in the cycling world, who would they be and why? Jan Ullrich, Marco Pantani and Miguel Indurain. They were some of the great champions of the era when I really grew to love cycling. Drug scandals aside, they were my heroes. Where would you take them to eat? I love entertaining at our house, so at home for some traditional food from the region where my family comes from Molfetta Italy. Have you had any nasty crashes? If so how did the worst occur and what was the consequence? No, I’ve been very very lucky. I had a couple of offs when I lived in Sydney in the space of a few weeks but only lost a bit of skin. What is your favourite post ride cafe, and what would you normally buy as a treat? Unfortunately, with the business, study and family, I don’t have much time for cafes and the coffee at my house is pretty good. What is your favourite local training route? 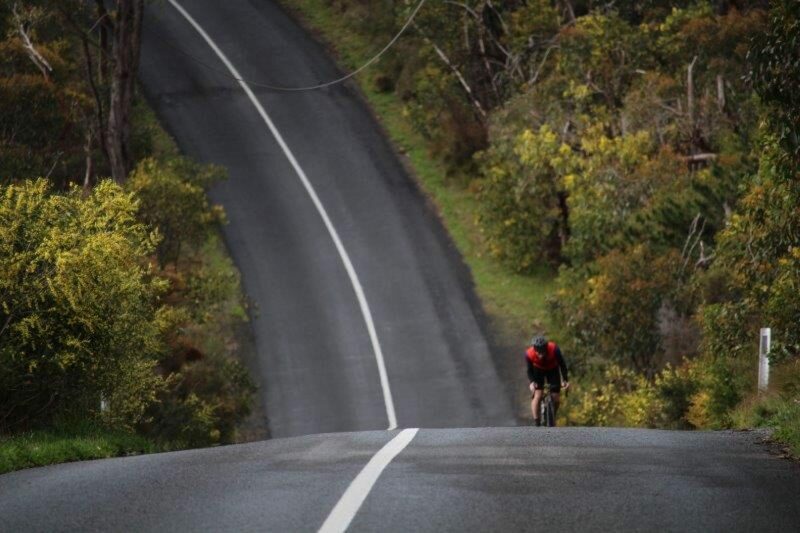 When I’m fit, probably the ride out to Lobethal via Norton Summit and back along Gorge Road. It’s not too long, offers a reasonable variety of terrain and has enough climbing to put some hurt in the legs. What is the biggest cycling lie you have told a partner? What cycling related thing would you like for your next birthday? Is there a local cycling outfit/company/cycling club/cycling group/person that you would like to plug? From a non-cycling perspective, what do you love about Adelaide? The ease of getting around and the ability to bring up kids around our family. The Adelaide Oval brings a great atmosphere to the city in winter for footy which I also love. What is your go to place when interstaters come to Adelaide? Adelaide Hills for lunch and Peel St for kick ons. Thanks Anthony, I pleasure to touch base, and I will pop around over the next few weeks.